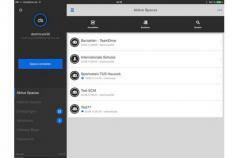 TeamDrive is a software solution that enables you to easily transfer and sync data across several computers regardless if some are online and others are offline. The setup process is quick and straightforward with no complex settings involved. All you need is an account to the cloud service where the data you want to sync is stored. Then, you’ll have to create a space you want to share, invite another user and you can start to sync. All files you upload to the cloud will be automatically transferred to the computer you invited. TeamDrive is particularly useful for business environments as once two computers have been connected to each other, it will automatically sync the folder when changes occur. Furthermore, the data is encrypted using AES algorithm so it is inaccessible by unauthorized third-parties. The application can also be used to backup important data and store it in the cloud. This allows you to access it from anywhere and easily recover files and documents if for some reason the ones stored on your computer are deleted, damaged or inaccessible.